The Self programming environment provides facilities for writing programs, and the transporter provides a way to save them as source files. Of all the parts of Self, the programming environment probably has the least research ambition in it. We simply needed to concentrate the innovation in other areas: language design, compiler technology, user interface. The Self programming environment strives to meet the high standard set by Smalltalk’s, but with a more concrete feels. The transporter, on the other hand, is somewhere in-between completely innovative research and dull development. It attempts to pull off a novel feat—programming live objects instead of text—and partially succeeds. Its novelty lies in its view of programs as collections of slots, not objects or classes, and its extraction of the programmer’s intentions from a web of live objects. On the Macintosh, Self uses option-click for a middle-mouse click, and uses command- (the apple key) click for the right button click. So wherever the text says “left-button-click” just click with the mouse, where it says “middle-button click” hold down the option key and click with the mouse, and where it says “right button click” hold down the command key and click with the mouse. These mappings are defined in Self, so you can change them by editing the whichButton: method in the initialization category in traits ui2MacEvent. Objects in the Self environment are represented as outliners, which can expand to show increasing levels of detail. One of these objects has been designed to provide a convenient context for typed-in commands, and so it is called the shell. If the shell is not already present on your screen, you can summon it by pressing the middle mouse button on the background and selecting shell. Outliners sport three small buttons in the top-right-hand corner labeled “/\”, “E”, and “X”. These buttons summon the object’s parents, add an evaluator text region to the bottom of the outliner, and dismiss the outliner. Press the “E” button to get an evaluator. The result object appears in your “hand” raised above the screen as if you were dragging it with the left button. Click the button to set it down. Now it shows a summary of modules containing the slots in this object (just programmingExamples here), four slots, and a category containing more slots, although those slots are not shown yet. The white triangle in the lower-right corner of the editor (which can barely be seen in the printout of this document) can be dragged to resize the editor. control-a Move to start of line. control-e Go to end of line. control-k Kill to end of line. control-l Expand the text editor to show the whole text. control-n Go to next line. control-o Open a new line after the cursor. control-p Go to previous line. control-y Yank text from past-buffer to editor. delete, backspace, or control-h Erase last character. meta-return (command-return on Mac) Accept. escape (also command-period on Mac) Cancel. meta-s (command-s on Mac) Save a snapshot. meta-x (command-x on Mac) Cut. meta-c (command-c on Mac) Copy. meta-v (command-v on Mac) Paste. meta-d (command-d on Mac) Dismiss morph containing typing focus. Object outliners: Push the “X” button at the top-right-hand corner. Drag it to the trash: left-drag on the outliner till the mouse is over the trash can, then release the mouse-button. Dismiss it via the right-button menu: hold down the right button over the outliner, move to the Dismiss button, then release. The Carpet Morph: start above (or below) and to the left (or to the right) of the outliner, over the background. Hold down the left button and sweep out an area that completely contains the outliner, then release the left button. The outliner should now be surrounded by a rectangle. Use the middle mouse button inside the rectangle to select Dismiss. The last two methods, dismissing from the right-button menu, and marquee selection with the carpet morph, come in especially handy with things like buttons and menus because such morphs cannot be grabbed with the left-button. Click on the desired part of the object, be it object, category, slot, text editor, or annotation (annotations will be explained later). Move the result 3 out of the way and left-click to set it down. Try one more change: adding a slot to the category “a category of slots.” Hold the cursor over the words a category of slots and select Add Slot from the middle-button menu. 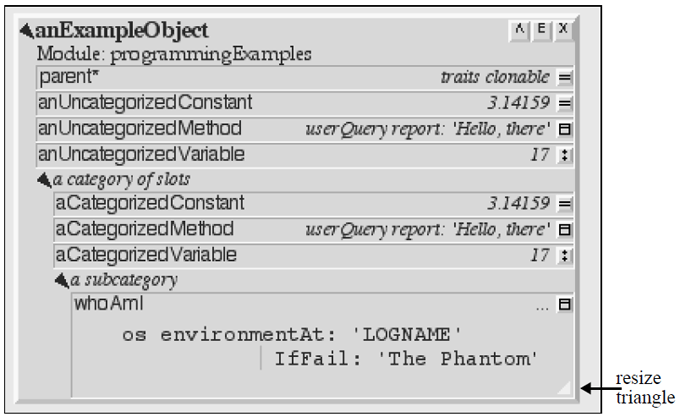 Explore the Self debugger. Start by scrambling the send to environmentVariable:IfFail: as if you had misspelled it. The stack filters out uninteresting frames by default 6. 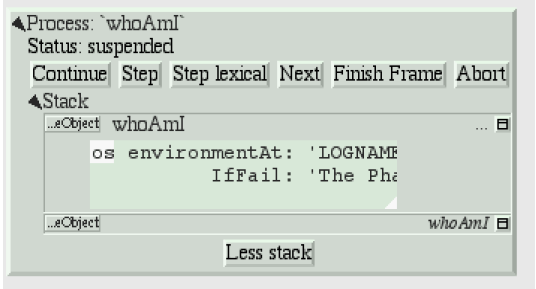 The debugger assumes that the first method you want to see is the one based on the text in the evaluator, and since the stack grows upwards this oldest frame appears at the bottom. It has no method name, and contains the code whoAmI. That method called whoAmI, whose code is too long to show next to the slot button, and that method called evnironmentAt:IfFail: because we just sabotaged it! Of course there is no such method, but Self creates one dynamically to handle the error. Fig. 6.3 Outliner with interface to the Macintosh. The affordance that appears on the right of the text is the scroll bar, and you can either drag on the little black line or just click in the bar to scroll the text up or down. This method is not too interesting (especially on the Macintosh), so leave the debugger by hitting Continue and letting the process finish. Congratulations on making through the interactive tutorial. In the remainder of this manual, we will dive deeper into the programming environment for readers who want to write real programs in Self. Step Perform one message send (skipping over trivial accesses and assignments); Steps into the called method. Step Lexical Execute messages until control returns to the same lexical method, or until this method exits. Very useful for methods with blocks. Next Performs a message send and any messages in the called method; Steps over the called method. Finish Frame Finishes running the topmost method. 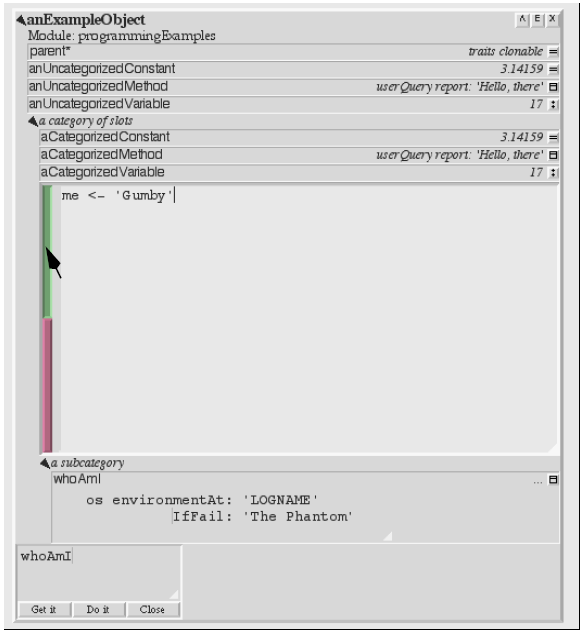 Abort Kills off the process and dismisses the debugger. Step Top frame: same as step button, not top frame: Finish any called methods. Next Same as next button. Retry Cut back the stack to this frame, then continue the process. Revert Cut back the stack to this frame. 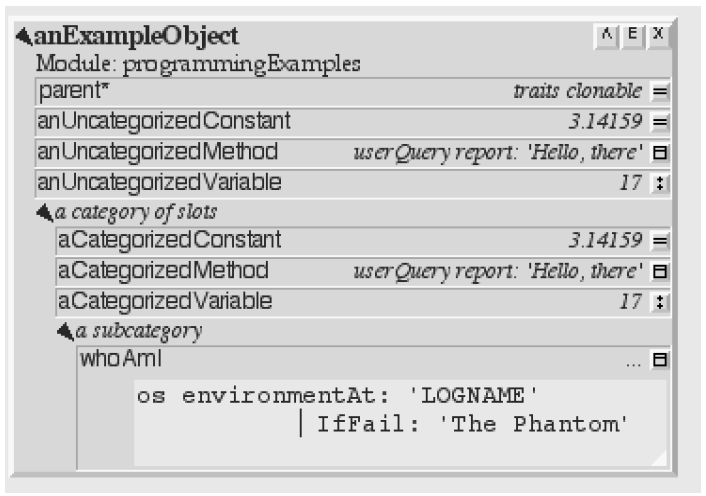 Implementors Finds all the slots with a given name. Implementors of : Finds all the slots with the given name that take an argument (for read/write slots only). Senders Finds all the methods that send a message with a given name. Senders of : Finds all the methods that send the corresponding assignment message (read/write slots only). Senders in family (Senders of : in family) Finds all the methods in this object, its ancestors, and descendants that send a message with a given name (or the corresponding assignment message). Find Slot Starting from a designated object, finds all slots in that object and its ancestors whose name matches a given pattern. Case is ignored, “?” matches any character, “*” matches any series of zero or more characters. Also comes in “of :” and “in family” flavors. 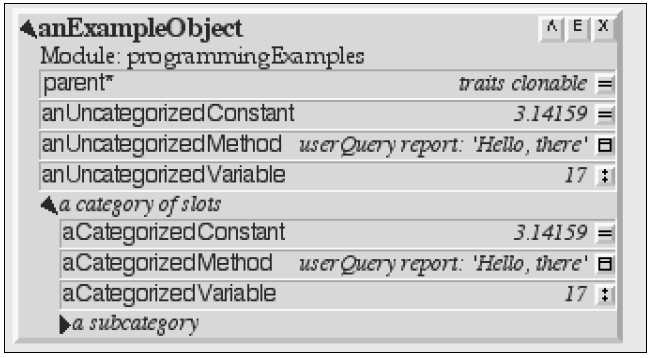 Methods Containing Finds methods containing the specified string. Similar to grep without wildcards. Copied-down Children Finds objects copied-down (see below) from this one. References Finds slots that contain references to the selected object. Slots in Module On the module menu (see below); shows all slots in a given module. Added or Changed Slots in Module On the module menu (see below); shows all slots added or changed in the module since it was filed out. Removed Slots in Module On the module menu (see below); shows the names of the slots removed from the module since it was last filed out. Expatriate Slots On the changed module menu (see below); shows all slots in filed-out objects that do not themselves specify a module. These slots will not be filed out. The copy-down and module enumerators will be covered later. The other enumerators can be summoned from several places: the outliner menu, the slot menu, and the text editor menu. As a shortcut, selecting a whole expression in the text editor and then asking for an enumerator will bring up the enumerator to search for the outermost message send in the expression. 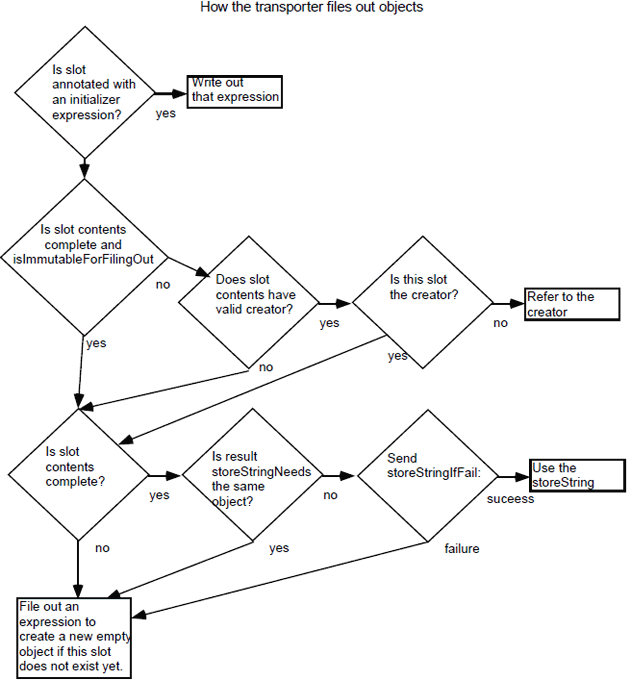 So if you select the following expression: aSet findFirst: elem IfPresent: [snort] IfAbsent: [sludge] and choose implementors from the text editor menu, you will get an Implementors enumerator ready to search for findFirst:IfPresent:IfAbsent:. Of course, you can always change the search target by double-clicking and editing the text. The text editors also implement a host of handy double-clicking shortcuts. Finally there is one last detail about enumerations: many contain a check-box to choose Wellknown only. This is always checked by default to speed things up. When checked, only wellknown (i.e. filed-out, see below) objects are searched, which is much faster. Hacking—the discipline of making fine furniture from trees using an axe. Removing a category. “Move” in category middle menu, then drag the category to the background or the trash can. Removing a category. Add slot or category to object or category. “Add Category” in object or category middle menu, then type in the new category name, then hit green button to accept. Adding a new category. Moving a category. “Move” in category middle menu, then drag to another object. Copying a category. Copying a category. “Copy” in category or category middle menu, then drag the category to another object. Copying a category. Removing a slot. “Move” in slot middle menu, then drag the slot to the background or the trash can. Removing a slot. Add slot to object or category. “Add Slot” in object or category middle menu, then type in the new slot name, “=” or “<-”, and contents of slot (or just name alone for variable slot containing nil), then hit green button to accept. Adding adding a new. Moving a slot. “Move” in slot middle menu, then drag to another object. Moving a slot. Copying a slot. “Copy” in slot or category middle menu, then drag the slot to another object. Copying a slot. Add a comment to an object or slot. “Show Comment” in the object or slot middle menu to open up a comment text editor, then typing in the comment, then hit the green button to accept it. If an object or slot already has a comment, it can be shown/hidden by hitting the small button labeled with a single quote. To amuse and intrigue those who follow. Edit a slot. “Edit” on a slot middle-button menu, then make any changes in the text editor, then hit green button to accept changes. To change the contents of a constant data slot, or to change contents and set initial value at same time, or to change a slot from data to method or from constant to variable. Edit slot name or its argument names. Double-click on the name of the slot, wait for red and green buttons to appear on the right of the name, edit the name, then hit the green button. To change a slot’s name or the names of its arguments. Change a method in a slot. 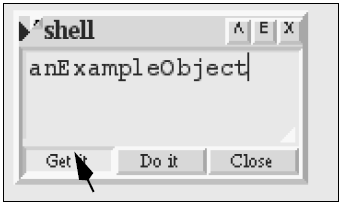 Click on the method icon button on the right of the slot to open a text editor on the method. Make the changes, then click on the green button to accept them. To fix a bug in a method. Change the visibility of a slot. On the slot’s middle menu choose “Make Public,” “Make Private,” or “Make Undeclared.” The Self interface uses bold, normal, and sans-serif fonts to indicate public, private, and unspecified slots.This distinction carries no semantics, but serves to record the programmer’s intentions. Change creator annotation of an object. “Show Annotation” in object middle menu to expose object annotation information, then click on creator path field and typing in desired creator path, then hit green button to accept annotation. Setting creator path tells transporter which slot “owns” this object, and tells environment what to name the object. Set creator of contents of a slot to that slot. “Set Creator” in slot middle menu. See above. Change copy-down information. “Show Annotation” in object middle menu to expose object annotation information, then click on copy-down-parent field and type in desired copy-down-path, copy-down selector and slots to omit) then hit green button to accept annotation. Simulates subclassing by allowing an object to contain copies of the slots in another object. When copy-down-parent has slots added/ changed/removed, the change propagates to the copied-down children. Change the object’s “isComplete” flag. “Show Annotation” in object middle menu to expose object annotation information, then push one of the isComplete radio buttons, then hit green button to accept the annotation change. After building a new prototype, set isComplete to get the environment to show its printString, and to get the transporter to use its storeString. Set the module membership of a slot, the slots in a category, or the slots in an object. Select “Set Module” from the middle menu of a slot, category, or object, then (for object or category) indicate which slots you want to change by choosing which module they currently belong to, finally select a new module to put the slots in. To ensure that slots are filled out in the correct source file. Type in or examine the module for a single slot. “Show Annotation” on the slot middle menu to expose the annotation, then click on the module editor, type in the module name, then click the green accept button. Save as above. Change slot initial contents. 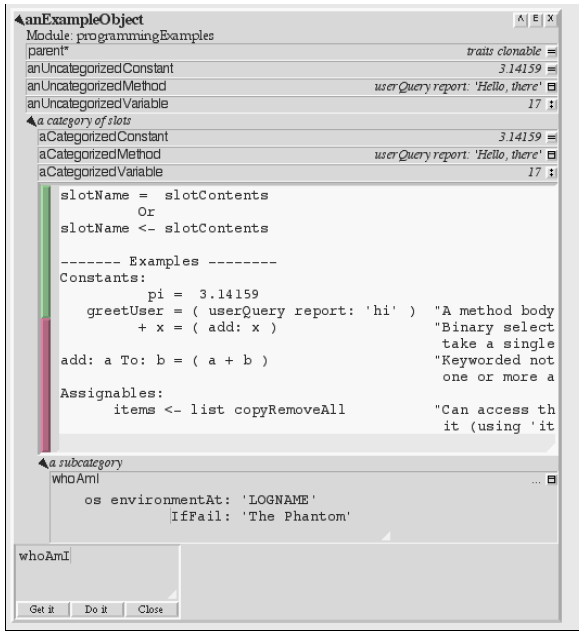 “Show Annotation” on the slot middle menu to expose the annotation, then click on the “Follow Slot” button, or type the desired initial value expression into the ”Initial Contents” editor, then hit the green accept button. To have the transporter record the current contents of a slot, choose “Follow Slot.” To have it ignore the current value and just record a given expression for the slot’s initial value use the “Initial Contents” option. The transporter has been built in order to move programs from one world of objects to another. You can ignore it as long as you work with just one snapshot. However, if you want to give your program to someone else, or save it as source, or read it in to a newer snapshot, you will need to learn about the transporter. This model grew up in an era where computers were too small to host both compilers and applications at the same time. Although it has some virtues it makes other operations very hard: it is hard to include data, such as hand-drawn icons, directly into a program, and it is hard to write applications whose data domain is really programs. A Self program consists of live objects. Self has no edit/run mode. 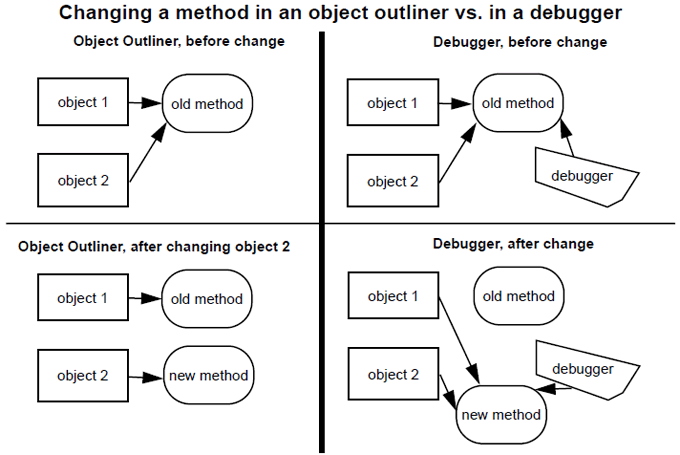 To change an object, you do not retreat to a source file, or even to a class, you just change the object itself. This immediacy and concreteness lessens the cognitive burden on the programmer, smooths the learning curve, and hastens gratification. However, this stance creates a big problem the moment you need to move a program from one world of objects to another; it is very hard to pin down what to do. For example, suppose an object contains a slot with 1024 in it. Should that value be copied literally? Perhaps it is the result of some computation (such as the width of the current screen) and should be recomputed instead. There simply is not enough information in a Self object to extract programs from Snapshots. Earlier in the project we considered constructing a calculus of changes that could be used to represent programs, and then moving programs by reapplying the changes to the new snapshot. But, we had enough on our plate and rejected this approach as too ambitious to tackle without a dedicated graduate student. Instead, we decided to represent programs as pieces that could be filed out of a snapshot and filed in to another. To allow us to merge changes to the same program, we decided to represent its pieces as Unix source files amenable to RCS. The Self Transporter was built to save programs as source files. But what is a program? Although a new program frequently involves creating new objects, it also can mean added slots to existing objects. For example, a program to find palindromes might add a slot to traits string called isPalindrome. So we decided to refine the granularity of the Transporter to the slot level; each slot has an annotation 8 (its module) which gives the name of the source file containing that slot. This hair- or rather object-splitting implies that one object may be built incrementally as the result of reading several files, and so the transporter endeavors to keep the order that the files are read in as independent as possible. 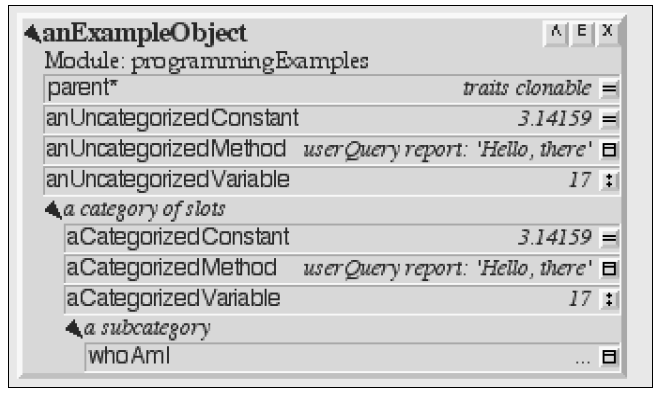 Since each object can possess slots in different modules, the outliner shows a summary of the modules of an object, sorted by frequency. Turned around, a module can be viewed as a collection of slots, plus some other information: each module also includes a directory, a list of submodules to be read in whenever it is read, and postFileIn method to be run whenever the module is read. These data allow modules to be organized hierarchically by subsystem, for example the allUI2 module includes all the modules in the ui2 system. Now here comes the nice part: the Self environment incrementally maintains a mapping from modules to slots, and a list of changed modules, which can be obtained from the background menu. When you make a change the appropriate module will be added to the list, and can be written as a source file by clicking its ‘W‘ button. 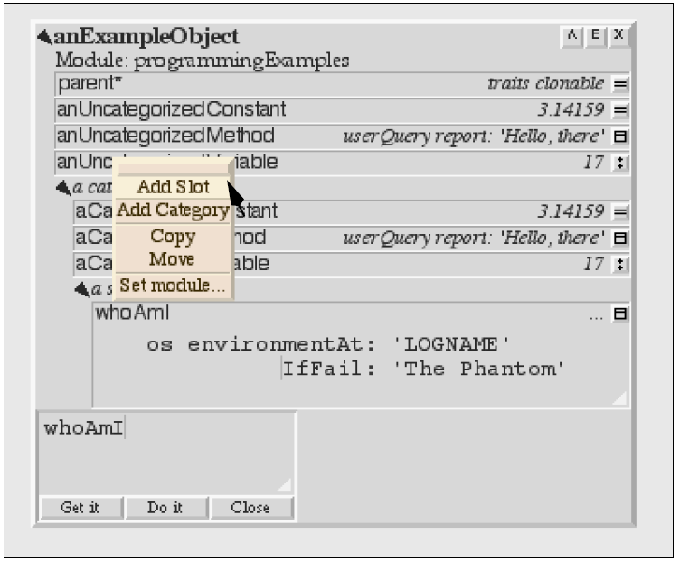 The middle-button menu on the changed modules and individual modules contains a host of useful entries for understanding what has been changed. Sometimes the programmer does not want to store the actual contents of a slot, but instead wants to store an initialization expression. 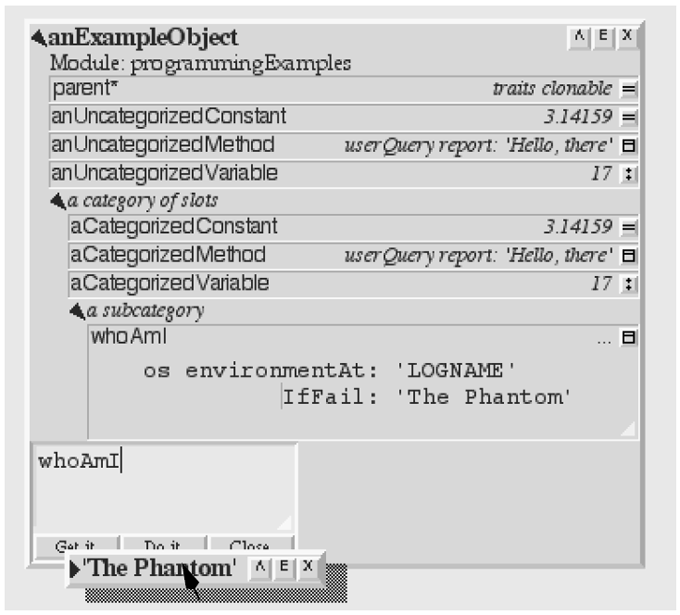 This intention is captured with another annotation on a slot: each slot can either be annotated Follow Slot or Initialize To Expression In the latter case, an initializer is also supplied. Even though the transporter is supposed to follow the slot, it may contain an object that is created by another slot. For example, the parent slot in a point should just refer to traits point rather than recreating the traits object. This information is captured by a Creator annotation on each object that gives the path from the lobby to the slot intended to create the object. In this case, the transporter just files out a reference to the object’s creator, cleverly enough so that the actual creator slot does not need to have been already filed in. On the other hand, if an object is immutable, its identity is not important. If an object is annotated as isComplete 9 the transporter sends it isImmutableForFilingOut and if that message returns true, the transporter never files out a reference. For example, integers would answer true to this message. If the contents of the slot is a simple (usually immutable) object like 17, 3@4, or ‘foo’ (the string) the transporter should just ask the object for a string to store. 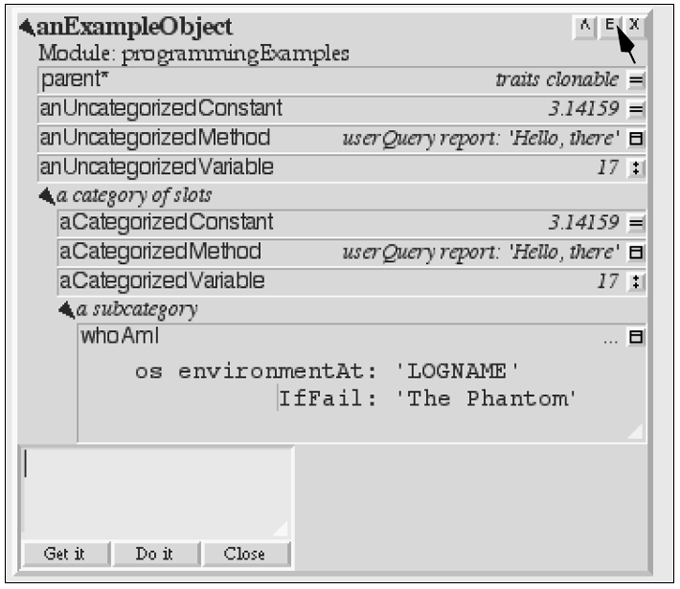 It does this by checking to see if the object is annotated as isComplete to see if it is safe to send the object messages, checks to see if this object is itself needed for the string (it would be a mistake to file out the prototypical point as 0@0, because the x slot would never be defined), then asks the object for a store string.To see if the object must itself be filed out, it sends storeStringNeeds and if this message does not return the object itself it sends storeStringIfFail:. If this succeeds, the transporter can save a data-type specific string for the object. This fairly elaborate mechanism allows programmers to add new kinds of objects that transport out with type-specific creation strings. Finally, if it can do nothing else, the transporter creates a new object for the contents of the slot. The object is created in a clever way so that a file that adds slots to an object can be read before the file that officially creates the object without loss of information. Filing out objects is too complicated, and over the past two years we have repeatedly tried simpler schemes. However, all of the capabilities in the current scheme seem to be essential in some case. This issue remains as a question for future work. The Basic Morph State category of slots has been copied from those in morph by first copying the morph and removing all its submorphs (i.e. by sending it copyRemoveAllMorphs) and then copying the resultant slots, omitting parent, prototype, rawBox and rawColor. The first three of these slots were omitted because their contents had to be different; copied-down slots are copied, they cannot be specially initialized in Self. The omitted slot rawBox is more interesting; circle morphs do not need this slot at all and so omit it. Most other object-oriented programming systems would not allow a subclass to avoid inheriting an instance variable. 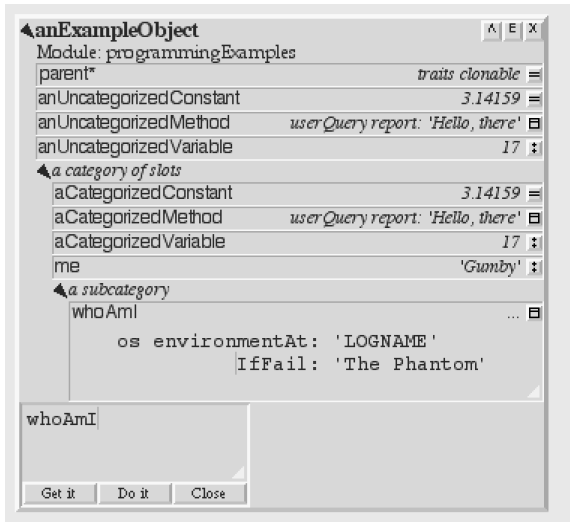 The Self programming environment uses the copy-down information to allow the programmer to use a class-based style when appropriate. For example, if the programmer adds a slot to morph the environment will offer to add it to circleMorph, too. 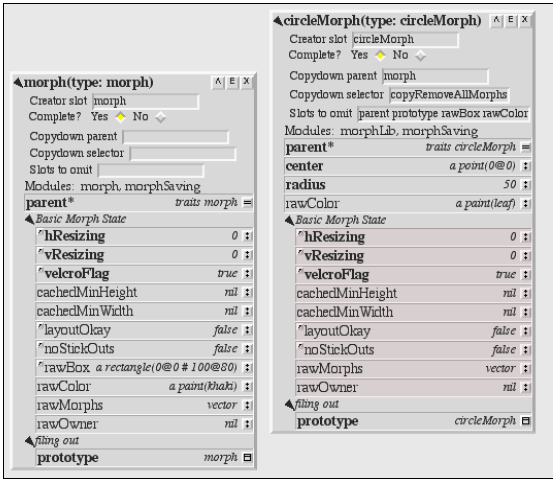 If the programmer should use a text editor to edit the definition of morph, the circleMorph object will be changed after rereading both object’s text files. The least convenient aspect of using copy-downs is that to do the moral equivalent of creating a subclass, the programmer has to create two objects: a new traits object, and a new prototype, and then set the object annotation of the new prototype. Perhaps someday there will be a button to do this, or perhaps other styles of programming will emerge. By default, the tranporter writes out Self modules out to a tree rooted in the current working directory, or the ‘objects’ subdirectory of the directory given to the VM in the shell environment variable SELFWORKING_DIR. Howevever Self modules have a slot ‘tree’ which can take a name of a tree. If the name of the tree is not an empty string, then the module writer will look up a directory in the dictionary found at modules init treeDictionary. Important considerations: module names are globally unique (that is, two modules called ‘webserver’ in different trees are considered the same module and will overwrite each other). The tree name itself should also be globally unique - that is it is not possible to have two trees with the same name in a single Self world. The advantages of this over a simple symbolic link to a separate filesystem tree is we can do overlays - if you want special string behaviour, then put it in your tree in my_tree/core/string.self and it will override as expected. Modules that import subparts will import them from the same tree by default. This test could be placed in the preFileIn slot of your module to ensure a sane file in environment before the rest of the file is read. This concludes a brief tour of the Self programming environment. Although we strove for simplicity in the design of Self, its programming environment includes a fair amount of functionality which may take a while to learn. We hope that you find the investment worth the reward. Double-clicking on the triangle will expand (or contract) all levels instead of just a single level. However, in a stack frame in the debugger (described below), the receiver of a message is the same as the receiver for the stack frame. I am revising this for Self 4.1 on my trusty Mac, and Self does not implement environment variables here. Since all that stuff in the text editor was initially selected, your typing conveniently replaced it all. 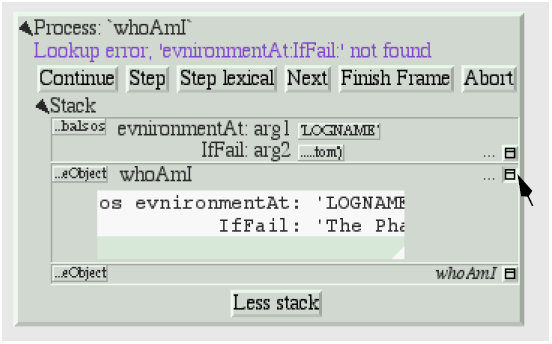 If you examine the slot’s annotation (available via the slot menu) it will show that the system has guessed that the new slot (named “me”) should be saved in the “programmingExamples” module, and that instead of saving its actual contents, the slot should just be initialized to the string ‘Gumby’. Since the Self compiler inlines calls automatically, Self code tends to be written in a highly-factored, deeply-nested style. 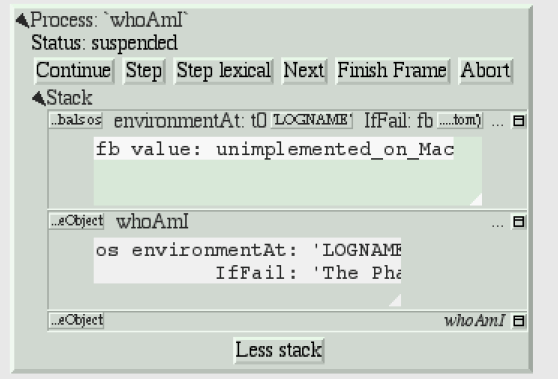 Thus, the debugger filters out stack frames that seem to be unimportant. If it ever filters out the frame you need to see, there is a “Don’t filter frames” entry in the stack’s middle-button menu. One rough edge remaining in the Self user interface is the existence of two test editors, and this one does not implement multi-character selection, sigh. Or, you could type control-A to go the start, and control-K to delete the whole field, sigh. The Self Virtual Machine provides for annotations on slots or whole objects. While the annotations do not influence program execution, they can be accessed and modified by Self’s reflective facility, mirrors. 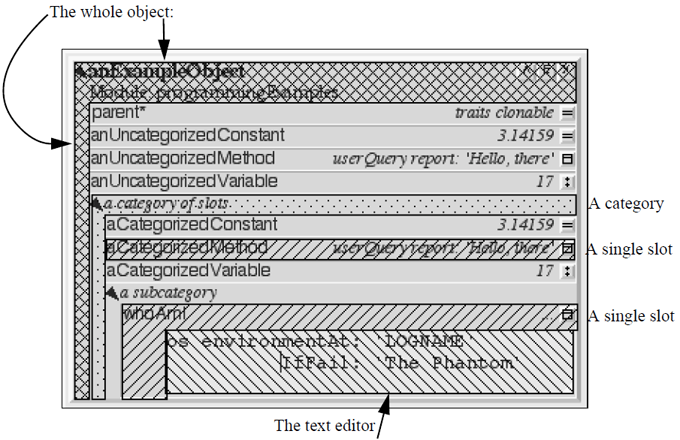 Annotations are used to hold many things, including comments on objects and slots. isComplete is used by the environment to decide when it is safe to send messages like printString. See http://semver.org for a specification. In essence, versions are of the form “3.2.1-alpha6”.